I know that wipes infused with lotion have been around for awhile and aren't fairly anything new. But this was a new concept for me, that I had been itching to get familiar with for quite some time. I usually spot lotion wipes at department stores and to be quite honest, I can't justify splurging on them because I feel as if they are an unnecessary item. I looked at it like this- What benefit does a lotion wipe have, that a bottled body lotion doesn't? Well, to find out the answer to that question I had to first try a lotion wipe, of course. When I saw that E.L.F. came out with a fun variety of affordable lotion wipes, I happily ordered two. Today, we are going to be taking a look at E.L.F. Studio Lotion Wipes in the scents Vanilla & Coconut, and Milk & Honey ($3.00, each). Vanilla & Coconut: It's no secret on this blog that I love skincare products that contain a coconut fragrance, so of course I had to order this one. And as expected, these wipes did not disappoint in the scent department. The vanilla and coconut merge together wonderfully to create an addicting tropical aroma, that I just love treating my body with. Very yummy. Although, I have to say, the coconut definitely overpowers the vanilla. But I don't mind that. 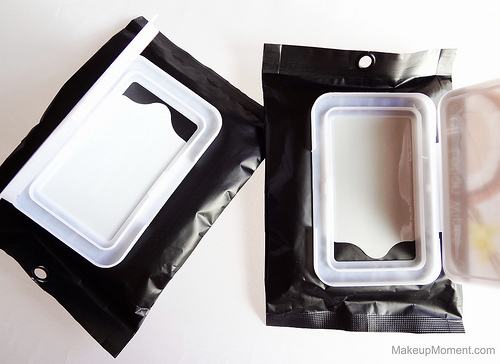 These wipes are my favorite of the two and I do plan to repurchase. Milk & Honey: Aside from coconut, I also enjoy warm, sweet fragrances as well. When I saw this one, I was very excited to give it a go. I was sure that the honey fragrance was going to be scrumptious. Well, I am sad to say that I was a bit disappointed with these wipes when it came to the scent. I don't get 'milk and honey' sweetness from this one. And the fragrance was-to my senses at least, a bit artificial. Each packet contains 15 sheets that are infused with amazing ingredients like aloe, cocoa butter, soy, Vitamin E, sweet almond oil, and coconut milk. All of these are great to help give the skin a nourishing boost of hydration, along with a bit of revitalization as well. When it comes to the packaging, I really appreciate that the packets contain a snap shut lid, instead of just the stick on/off seal that most wipe packets have. The seal along with the addition of the lid, really ensures that the wipes don't dry out, and remain moist for a long time. A tip that I always abide by, to make sure the wipes do indeed retain their moisture is to store the packets front side down. When done so, the juices will seep all the way to the first cloth and that way, you always pull out a moist wipe every use. This tip works wonders! These wipes are decently sized so one wipe is definitely more than enough for a full body application. They are really moist, too. When I wipe the cloth all over my body, my skin is instantly introduced to a refreshing, cooling sensation, that feels very soothing. The lotion goes on colorless and has a thin, almost water-like consistency. It feels lightweight on, and doesn't leave behind a sticky or uncomfortable residue. Once I have applied the lotion, I allow 10-15 minutes for it to properly dry. After it does, my skin feels moisturized and smooth to the touch, all day. In addition, the scent lingers on my skin for a good portion of the day, as well. Overall: I think now I see why some people prefer lotion wipes to bottled lotions. They are super convenient to have around. And not to mention, mess free. Gotta love that! These lotions wipes are great to carry around in your purse, for those times when you feel like your skin needs a little refreshment; especially during those hot and humid, summer days. It would have been really nice if these contained an SPF of some sort. If they did, these would have made perfect beach-bag companions. 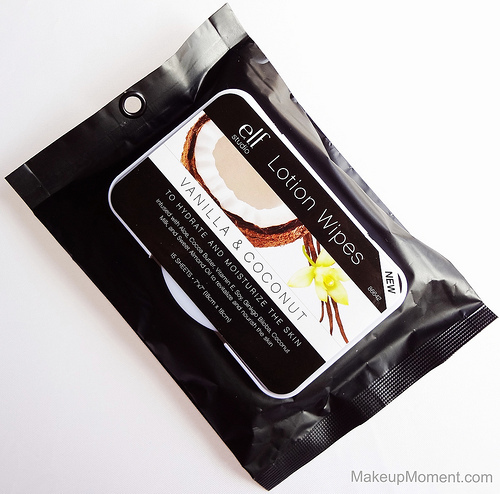 I simply loved the vanilla & coconut wipes and can't recommend them enough. I am going to stock up, for sure. I can't wait to try E.L.F. 's other lotion wipe varieties, too. I have my eye on the Shea butter and cucumber & melon lotion wipes, next! What do you all think of E.L.F. 's Lotion Wipes? 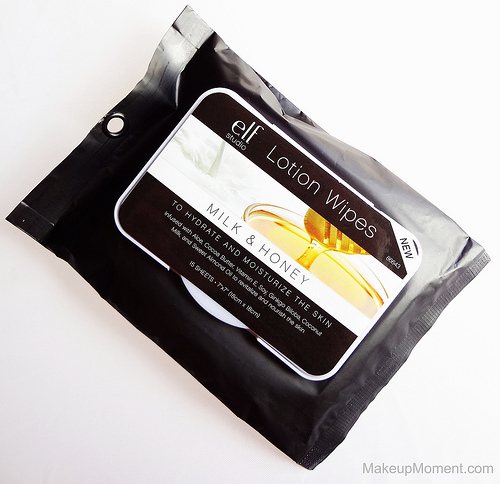 Which are your favorite lotion wipes to use? I also love any products with coconut in. Smells so good. 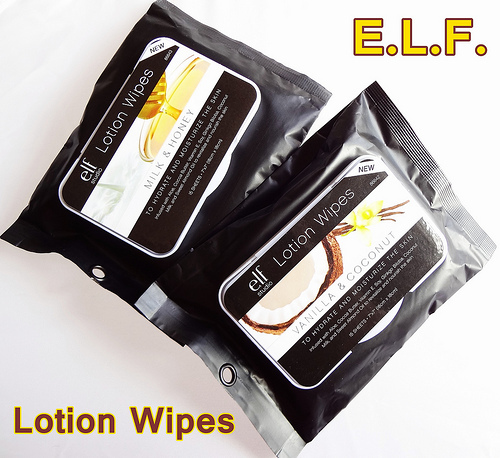 I have tried a few things from e.l.f but never their wipes. I think i will be checking them out for sure. Such a great price. YAY for coconut scents :) If you decide to try these lotion wipes, let me know how you like them, Vicki! Great post! I love your thorough reviews! :) I like warm, sweet fragrances as well! Ive never heard of these but I definitely would try them. Def worth the $3! oddly enough, i've never even heard of lotion wipes! these sound amazing, esp the coconut vanilla...i want to try these!